This PDF guide steps you through the installation of the LAMP Server on openSUSE 15. Once installed we configure the MariaDB database server we tables, views and include foreign key constraints. With the database and tables in place we can move to developing PHP pages to view and add rows. For authenticating users to the application we store encrypted passwords in a table and use password_hash and password_verify functions within the application. Code examples are included so you can reproduce the application on your own system. 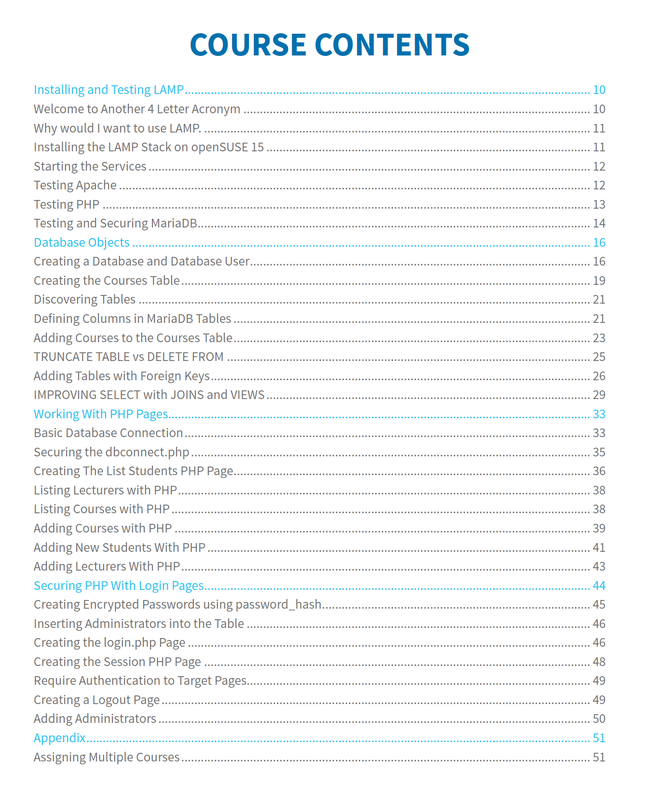 This 51 page PDF guide steps you through the installation of the LAMP Server on openSUSE 15. We the move into the MariaDB. Mainly this could be MariaDB or MySQL. The BASE64 encoding functions are not available in MariaDB but this is not a major issue. We create the eduction database with 4 tables Admin, Courses, Students and Lecturers. Foreign Keys constraints are created from the Students and Lecturers table back to the Courses table. The Admin table is used to authenticate users to the application. As well as the tables we create Views so we can easily see the course names that students and lecturers are assigned to. The Views implement SQL JOINS to accomplish this. Moving on to PHP we create the pages to list and add data into the tables. We mix PHP and HTML code to create dynamic web pages. We do not decorate the pages and neither CSS or HTML decoration is part of the course. In securing PHP we look at implementing authentication from PHP to the Admin table in the database. Using password_hash and password_verify function to encrypt and authenticate passwords. The encrypted passwords are additionally encoded in the database to obfuscate the crypt and salt.